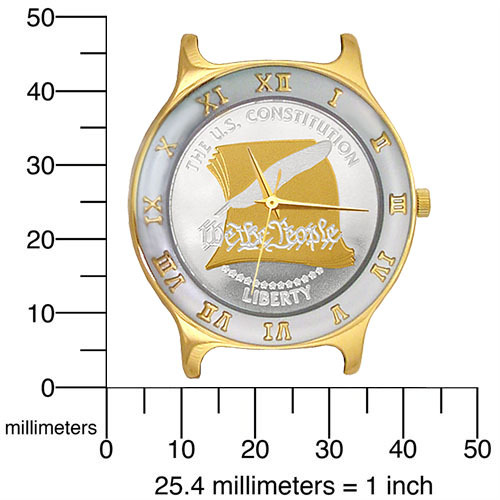 Featuring a genuine US Constitution medallion this watch is perfect to express one's appreciation for liberty and the American Spirit. The great American document is enhanced with precision gold accents on a pure silver overlay. The classic styled raised Roman numeral bezel is also accented in gold. The case is solid stainless steel with a high quality 3-micron heavy gold plate, waterproof up to 3 atmospheres. Comes standard with a genuine Swiss Quartz multi-jeweled movement and matching bracelet. 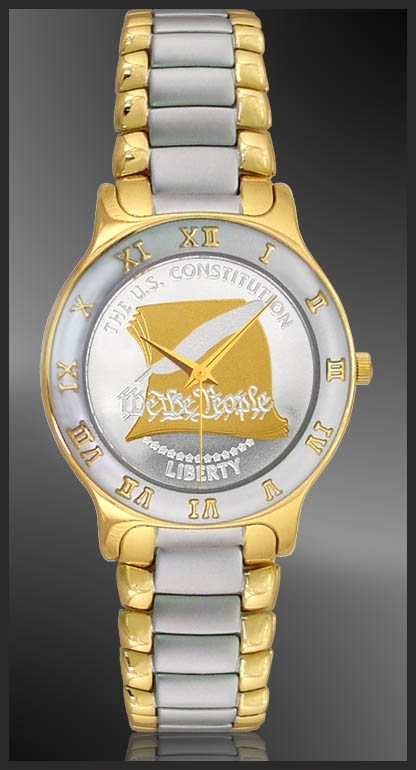 Featuring a genuine uncirculated US Constitution Medallion this watch is perfect to express one's appreciation for liberty and the American Spirit. The great American document is enhanced with precision gold accents on a pure silver overlay. The classic styled raised Roman numeral bezel is also accented in gold. Both case and band are solid stainless steel with a high quality 3-micron heavy gold plate, waterproof up to 3 atmospheres. Comes standard with a genuine Swiss Quartz multi-jeweled movement and a lifetime warranty against defect. Each timepiece is accompanied by a uniquely numbered signet and a certificate of authenticity. After owning another Aurista watch for many years, I recently purchased Aurista's U.S. Constitution Men's Bracelet Medallion Watch to add to my collection. I'm glad I did so. It's extremely attractive. I enjoy wearing it to show that even many years after my active military service ended, my support of our Constitution hasn't wavered.